News and Events » News Stories » Top 25! Kalamazoo College placed 24th overall in 2013 RecycleMania, a friendly (and eco-friendly) sustainability competition among colleges and universities that focuses on waste minimization and recycling. More than 600 schools in the United States and Canada participated this year. 2013 was an off-year for K compared to its performances of previous years; nevertheless, it finished in the top 25 in six of the competition′s eight measurement categories. RecycleMania began in 2001 as a competition between two schools. More schools were invited in the following years. 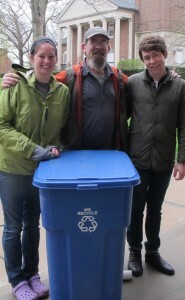 Kalamazoo College joined the fun in 2005 and quickly became a two-time first-place winner in the recycled bottles and cans category. The College won grand champion in 2008 and enjoyed three consecutive top-five overall finishes before 2013. The K recycling program was started in 1992, with Rob Townsend–a.k.a. “Recycle Rob”–as its beloved leader. 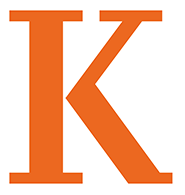 Sustainability is one of the pillars of the Kalamazoo College honor code. In 2007, President Eileen B. Wilson-Oyelaran signed the American College & University Presidents Climate Commitment. Like K, Recyclemania is a small entity that makes a big difference. Calculations for the 2011 Recyclemania results show the combined efforts of participants that year prevented the release of 127,553 metric tons of carbon dioxide, or the equivalent to the release of greenhouse gas emissions from 25,000 passenger cars. That′s big! At K, students can help the earth year round. They can use “The Bat Cave” in the basement of Dewaters Residence Hall. The Bat Cave houses the Resource Exchange Program where students have donated numerous items for reuse. Bat Cave also is home to HUB (Helping Understand Bikes). HUB students fix and rent bikes. And don′t forget to bring your e-waste (computers, printers, cartridges, cell phones, calculators, etc.) to the Bat Cave. The recycling program is always looking for student workers. Reduce, Reuse, Recycle! This entry was posted in News Stories and tagged awards, green, recycling, students, sustainability, . Bookmark the permalink. Class of 2015, Communication Intern. She is a German and International Area Studies double major.